TruBiotics Reviews - Is it a Scam or Legit? If you’re focused on improving your health from the inside out, there’s no doubt you’ve heard about probiotics, and have probably seen a recent TV ad for TruBiotics. This once-daily supplement is claimed to help support digestion and improve immune system health by maintaining balanced levels of good bacteria in your gut. But is there any truth to these claims? Read on to see what we found out. According to the TruBiotics website, 70% of your immune system is located in your digestive tract, and it’s primarily supported by balanced levels of “good” bacteria. However, changes in lifestyle such as extensive travel, high levels of stress, and poor diet can deplete these bacteria, and can lead to gastrointestinal upset and even illness. To combat this, similar to Whole Body Keybiotics, ProbioSlim, and many others, TruBiotics is a probiotic that is claimed to replenish these good bacteria levels in your gut, resulting in improved digestion and a boosted immune system. TruBiotics claims to accomplish this by blending two of the most common probiotics: Lactobacillus acidophilus LA-5® and Bifidobacterium animalis BB-12®, which have been shown to have a wide variety of digestive and immune system benefits. Unlike other probiotic manufacturers though, TruBiotics comes in a TruPreserve™ bottle, which is claimed to ensure that the bacteria are viable until the expiration date, and which does not require refrigeration. Each capsule of TruBiotics is claimed to contain 1.5 billion probiotic cells, in addition to secondary ingredients such as anhydrous sugar, skim milk, hydroxypropyl methylcellulose, yeast extract, and sodium ascorbate. The supplement is manufactured in Denmark under high-quality standards, and is claimed to be safe for individuals 3 years of age and older. 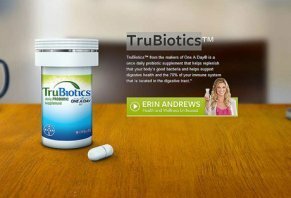 TruBiotics can be found at numerous online and physical retailers, including Drugstore.com, Amazon.com, Walgreens, CVS, Rite Aid, and many more. Prices appear to range between $14.50 and $20 for a 30-count bottle. Refund policies will vary by retailer. What Do Other Consumers Have to Say About TruBiotics? TruBiotics is manufactured by Bayer HealthCare LLC—the same company who brought you One A Day multivitamins—based out of Wayne, NJ. The company holds an A+ rating with the Better Business Bureau, with only one closed complaint over the past three years. Online customer reviews regarding TruBiotics appear to be more positive than negative. However, the most common complaints reference failure to work, constipation, price, and poor quality (see more about this in the following section). With this said, it appears that the company responds to complaints and works to rectify the situation quickly. Regarding probiotics in general, the most common complaints include gassiness and bloating, which typically subside after a day or two. What’s the Bottom Line About TruBiotics? First, TruBiotics contains skim milk, which could be problematic for individuals with lactose sensitivity. Second, the number one complaint we encountered during our research was that TruBiotics capsules are extremely fragile. In fact, numerous customers stated that simply allowing the bottle to fall on its side was enough force to break several capsules and to spill their contents. On top of this, we also read several complaints that the capsule coating made them difficult to swallow and digest. Because of these concerns, if you do decide to purchase TruBiotics, we would recommend doing so at your local drug store. This way, you can save money on shipping and handling charges, and can make the return process much easier if you decide to return the supplement. What’s your experience with TruBiotics? Is it a worthwhile supplement? Tell us all about it by writing a review! I started taking TruBiotics to help with my constant diarrhea. After about a week, I was so constipated and bloated that I couldn't even pass gas. I ended up in the ER with a distended abdomen, decreased bowel sounds and was so backed up that I needed two enemas, along with orange juice mixed with mineral oil. I've always battled diarrhea until I took these, and I will never take them again. I had problems with my digestive system but since I've been taking TruBiotics I have no more digestive problems. Those little capsules that I take with a meal everyday for 30 days have regulated my system. Very good supplement, worth every penny, and I would recommend it to my friends and family. Not much change, but didn't make me sick. I've been looking into different supplements and a probiotic was suggested. I purchased TruBiotics about 4 months ago. I take them daily with a multi, fish oil, and biotin. I do not have any health concerns, just want to make sure I'm taking care of my body. These pills are very easy to take and I haven't had any break open. I just really haven't noticed a difference. Although I do get a little gas and bloating, but from what I've researched this is totally normal for probiotics. I appreciate the other reviews and hope everyone found something that made them feel better. I have tried numerous things for my IBS from prescription to over the counter, the results usually end with me being constipated or going the other way, and not leaving the bathroom altogether, after 7 days I have had nothing but GREAT results. Time will tell, but as of right now, it has worked far better than anything I have been given to try or I purchased to try. I started taking this about six months ago for four days, and it constipated me and gave me horrible stomach pains. So I stopped it just in case that was the problem. I just started taking it again four days ago, and lo and behold, the horrible stomach pains and constipation started again. Obviously it is the Trubiotics and I won't take it again. I never have trouble with constipation. It's usually the other way around. I thought, and my doctor thought, I needed more probiotics, etc. My doctor actually advised me not to take this since this has happened twice. So it doesn't always mean you have an underlying condition and that's why you can't take it, per the person that wrote before about having an underlying condition. Some things just don't work for everyone. Our bodies are all very different and respond differently to foods, medicines, etc. It's not rocket science to figure that out. I don't like yogurt, so I thought this would be a good way for me to get the probiotics, but it's obviously not the answer for me. It's always good to try different things to see if they work for you, but be sensible about it and listen to your body. If you feel bad, stop taking it and see what your doctor advises you to do. I wish it would have worked for me. This product eliminated morning allergies for me entirely. I never had any cramps. It's only 1.5B dose which is very low. If this makes you sick, you either didn't wait long enough or you have an underlying condition and it's simply trying to fight (see a doctor). It's also eliminated all heart burn for me. My trouble foods are no longer trouble. I am a 46-year old male. I started these with an antibiotic for a UTI. I started having stomach cramps and explosive bouts of diarrhea. As a nurse I can't spend all shift in the bathroom! I had unbelievable gas and cramping. Sometimes it took my breath away it was so bad. I personally would not recommend these to a lot of people, then again it has worked for many others. If you are a nurse you should know probiotics can cause this but it's because it's cleaning you out. If it happens it generally is only the first 24-48 hours. Kind of funny a nurse wasn't aware. I thought Trubiotics would help with the gas and bloating I get after eating every meal. After taking it for 4 days, I got the worst stomach pains I've ever had. I was literally doubled over in pain every time I stood up. I thought I had the stomach flu. At first I didn't relate my pain with the pills until I read online that others had gotten severe stomach pains from it. It must work differently for everyone because some reviews were really good. Not for me! The same exact thing happened to me, twice. I stopped taking them the first time thinking maybe I had to the flu but wasn't sure. Six months later (now), I thought I'd give it another shot. I'm miserable with gas pains and tons of bloating, constipation and pains. It's just not for everyone. Wish it would have worked for me. After taking the pill for 4-5 days, I started getting stomach pains and diarrhea. Also, I've experienced bloating and a lot of gas. After going through this for 3 days, I quit taken it. This did not work for me, but my son has been taken it for a while now and it has helped him. It's like anything else, Try it, may work for you and may not. Write a Review for TruBiotics!